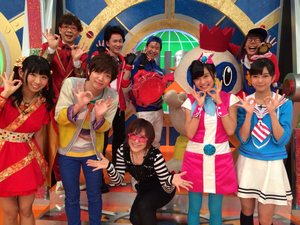 Oha Suta (おはスタ) is a children variety show that airs on TV Tokyo in Japan weekday mornings. It premiered in on October 1st, 1997 and was hosted by Pokémon alumni Kōichi Yamadera (山寺宏一). 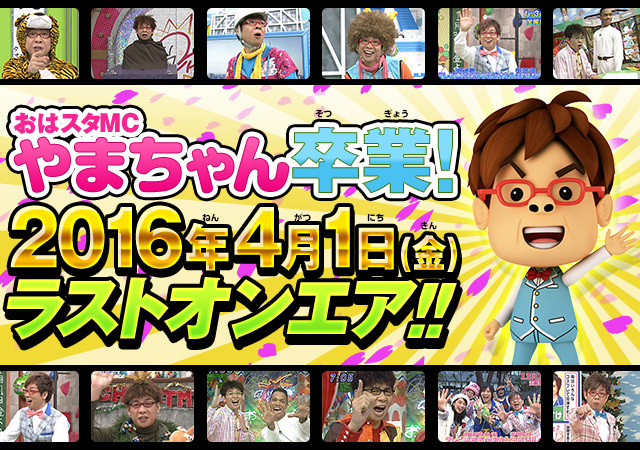 Koichi Yamadera's final episode as MC aired on April 1st, 2016 and he had been the MC of the show since its premiered. He departed the show and indicated that he believed it was time for the next generation to take over the show. Replacing him as the MC's of the show were Hanae Natsuki （花江夏樹） / Hana-chan (はなちゃん) and Yūki Ono （小野友樹） / Ono-chan (おのちゃん). After her stint on Pokémon Smash as a member of the International Division, Maru Kiuchi joined Oha Suta on April 6th, 2016 as a bilingual MC at the age of 14. In an interview with Hustle Press on October 26th, 2016, she revealed that although she was born in Russia, she doesn't speak Russian and left the country when she was 2 years old. She speaks English at home with her parents. The show's full title is "Oha Suta - The Super Kids Station". The show celebrated its 15th anniversary in October of 2012. 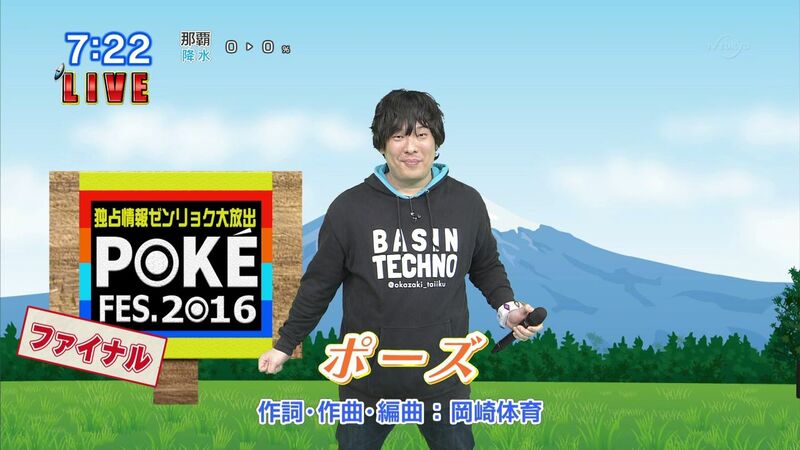 Oha Suta is a remake of the variety show Ohayo Studio (おはようスタジオ). Various products and television shows are featured in segments throughout the broadcast. Guest, musicians, comedians often have segments on the show. The show also features the Oha Girls (おはガール), who appear on the show as secondary hosts and participate in segments. The show is broken up into two halves, the first part Oha Suta 645 GO! GO!!! (おはスタ645GO!GO!!!) starts at 6:45 am while the second part called Super Live (スーパーライブ). 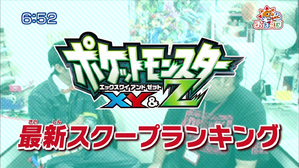 Many of the segments in the first half of the show are pre-recorded segments but the second half is mainly live in-studio with Yamadera and the other hosts. Pokémon: The World: Becky would teach viewers English by having a word of the day like Harden but would tie the word into Pokémon somehow. Oha Oha Ranking (おはおはランキング): This segment has people giving their top 3 rankings in for a specific topic. Office Chief Taka made a guest appearance and gave his top 3 Favorite Pokémon. SCANDAL also made an appearance on the August 7th, 2014 episode to give their Best 3 Pokémon they want to sing together with (一緒にうたいたいポケモン). 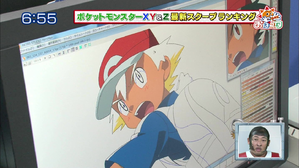 Pokémon Movie Trailer Debut: As Kōichi Yamadera has been a voice actor on all the Pocket Monsters movies, the latest trailers often debut on Oha Suta on Thursday mornings and then are broadcast on the anime episode later that day. Movie posters also often made their debut on the show. Pokémon Game Scoops: Most notably during the 5th generation games, the cast of the show would reveal new information about the games. A new feature was announced daily and clips from the game and artwork was shown. Pokémon Tretta School (ポケモントレッタスクール! ): A few times a month during the end of 2014 and the beginning of 2015, Tretta Leader Kento ( トレッタリーダー ケント) and Eririn （えりりん） appeared on Oha Suta to present this segment. Basic aspects of the Pokémon Tretta game were introduced to viewers to help them learn about the game but announcements about special events and new features were also discussed. Oha Suta Pokémon Division (おはスタポケモン部): Hosted by Yamamoto from Robert and Shoko-tan, the segment covers many aspects of the Pokémon franchise. This segment began airing November 24th, 2014 and Yamamoto would Tweet the day before when the next segment would air. Often a guest would appear in the segment to discuss something in particular and specific about the Pokémon franchise such as an episode of the anime or something game related and Yamamoto and Shoko-tan would comment and discuss the topic with the guests. Hoopa's Appear! Plan (フーパのおでまし大作戦): A short anime series featuring the mythical Pokémon Hoopa, the star of Pokémon the Movie XY: "The Archdjinni of Rings: Hoopa" began airing every Thursday starting on April 23rd, 2015. 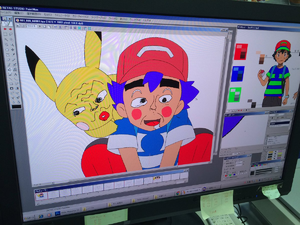 The mischievous Hoopa startled Satoshi and Pikachu a lot and also legendary Pokémon Appear! as well. Listen to Hippopotas! 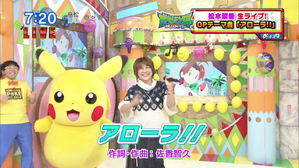 : Hosted by Shinichi Shinohara, who plays Hippopotas in the 18th Pocket Monsters movie, the segment had extravagant guest voice actors on one after another! 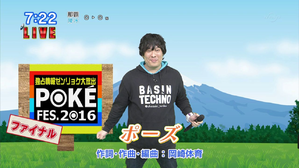 Pokémon Headline (ポケモン ヘッドライン): Hosted by DJ KOZY and DJ Hanamaru (ハナマル), the segments aired in 2015 and 2016 and announced events that were going to take place such as the 18th Pocket Monsters movie, Tomohisa Sako's studio live appearance and the Special Exhibition - Pokémon Lab: You do it! You discover!. The official Oha Suta site also posted an interview with Tomohisa Sako as an after broadcast related website promo. 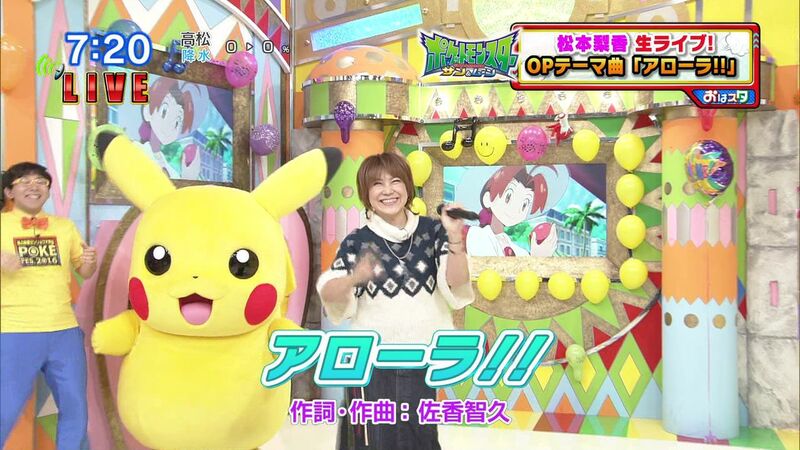 Rica Matsumoto and Tomohisa Sako were both special guests on the January 21st, 2016 episode of Oha Suta and during the Pokémon Headline segment, the TV Anime 'Pocket Monsters XY&Z' Character Song Project Collection vol. 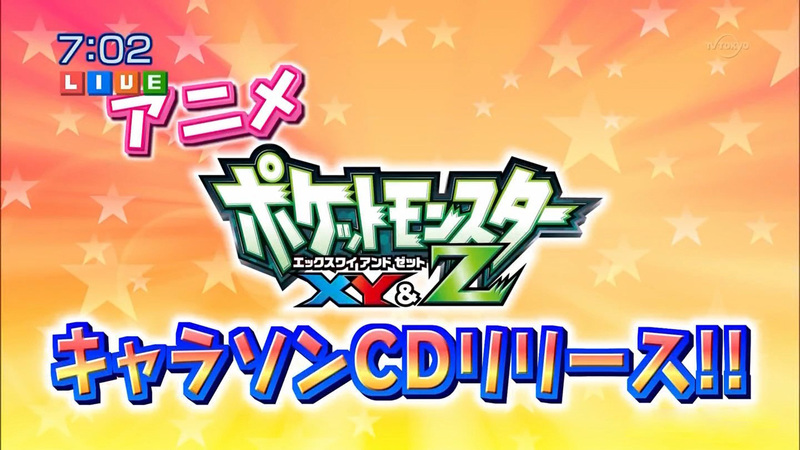 1 CD was promoted and Rica sang a live version of XY&Z while the opening video played on a large monitor behind her. 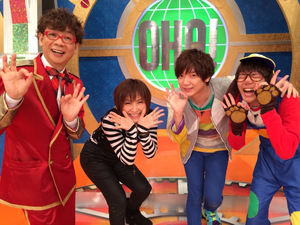 The Oha Girls Twitter account also posted pictures from their appearance on the show. 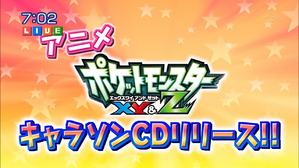 Pocket Monsters XY&Z Latest Scoop Ranking (ポケットモンスター XY&Z 最新スクープランキング): On Thursday's episodes for the weeks leading up to the debut of the Pocket Monsters XY&Z anime premiere on October 29th, 2015, Robert hosted this segment which gave some behind the scenes information, artwork and clips about the new series. Yamamoto visited OLM and got to interview some of the people in-charge of the series including: Haruna Ooba （大場春奈） - Key Animator, Daisuke Masutani (増谷大輔) - OLM Production Desk, Hiroyuki Kato (加藤浩幸） - Anime Producer, Toshihito Hirooka (広岡トシヒト) - Character Design and Director Tetsuo Yajima (矢嶋哲生). POKE FES. 2016 (おはスタポケモンフェス2016): From Monday, November 14th, 2016 until Thursday, November 17th, 2016, Oha Suta held the special Pokémon Festival 2016 to help promote the Pokémon franchise and the launch of the games Pokémon Sun and Moon. Day 1: Monday, November 14th, 2016 - Director Yamamoto and Watanabe Runrun visit OLM to investigate the production company which worked on making the Sun and Moon anime. Yamamoto had a fun time learning how the coloring process takes place using the program RETAS STUDIO PaintMan and painted an "interesting" frame of Pikachu and Satoshi. Day 2: Tuesday, November 15th, 2016 - More footage from Director Yamamoto and Watanabe Runrun's visit OLM was shown. Day 3: Wednesday, November 16th, 2016 - Footage from the 29th Shogakukan DIME Trend Grand Prize Awards Ceremony (第29回小学館DIMEトレンド大賞授賞式) was shown and Pikachu and Tsunekazu Ishihara were there where an award was given to Pokémon GO. 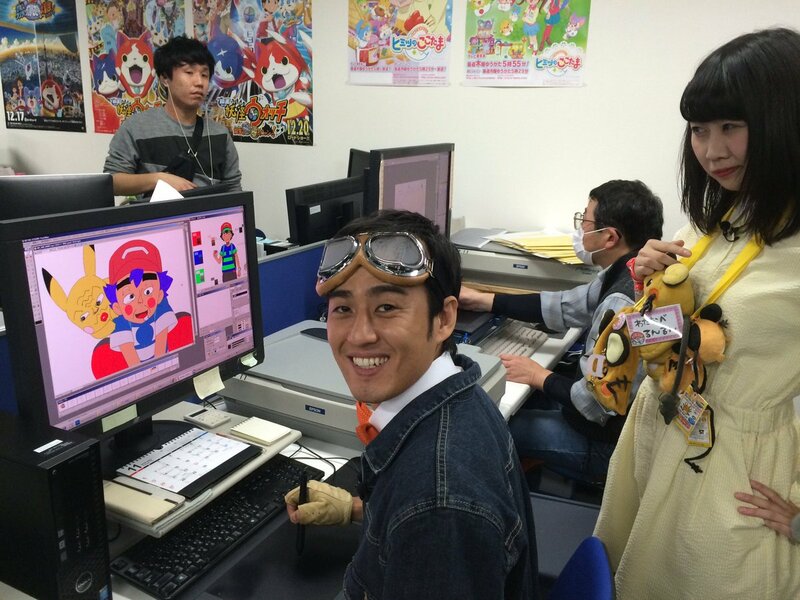 More footage from Director Yamamoto and Watanabe Runrun visit OLM was shown and this time the poster for the anime Sun and Moon was shown as well as exclusive footage showing Okido. Day 4: Thursday, November 17th, 2016 - Rica Matsumoto and Taiiku Okazaki where special guest on this episode and they sang the opening and ending themes for the Pocket Monsters Sun and Moon anime. Rica sang Alola!! while Taiiku sang Pose. This page has been viewed 16243 times.